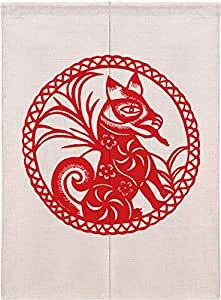 Japanese cotton doorway curtain with good drapability and used thick linen cloth material,exclusive pattern printed on each side,handmade with great care. Divider Doorway Curtain-Use it as doorway divider,curtain or wall hanging,perfect for home,office,restaurant,dinning area,windows,kitchen and etc. Morden linen and cotton doorway curtain with good drapability and used thick linen cloth material,exclusive pattern printed on each side,handmade with great care. Package included: 1 pc doorway curtain with rod.